Zoom into the bottles: no internet access required! 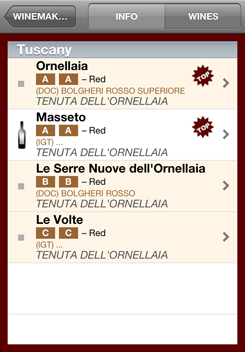 Top wines, "other wines of excellence"
Vinum Index FREE is the guide to the finest Tuscan wines and their producers, in free version. 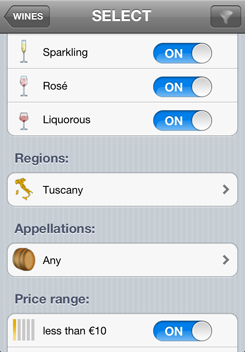 The Wines section (first button on the black bar) presents the Vinum Index wines. 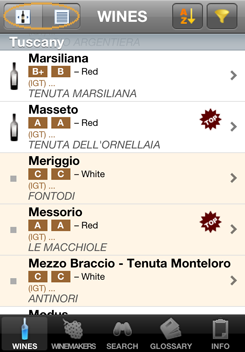 Browse among the bottles using the grey arrows, or by moving your finger on the screen. The numbers next to the arrows specify the number of wines to be found in the corresponding direction. 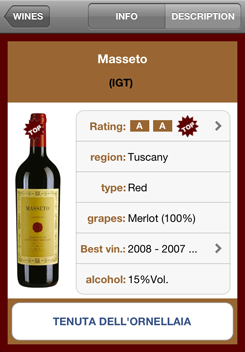 You can scroll through all the wines in "list" mode, and change the mode with the button in the upper left hand corner. 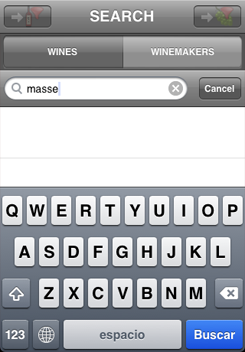 Press on the icon with the magnifying glass symbol to see the enlarged image of the bottle. All the images are incorporated in the application, which means that you don't need an internet connection to use the guide. 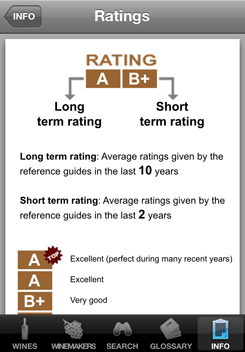 - Average grading for the last 2 years (wines which are easy to find and buy). - Average grading for the last 10 years. 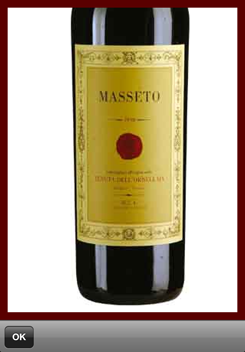 Nearly all the wines in the guide are accompanied by a list of memorable vintages. 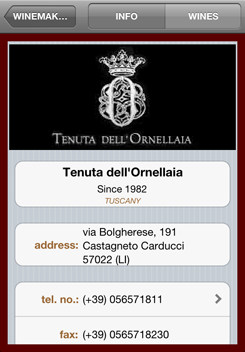 You can go to the list of the best vintages from the entry for each wine, or by clicking on the icon inside the circle. To remove the filter currently selected, press on the funnel icon with the red X in the upper right hand corner of the SELECT section. 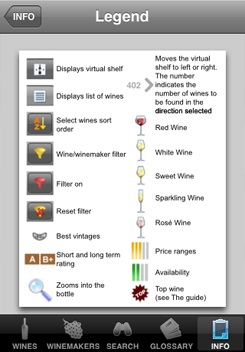 You can go to all the details for each wine or each producer included in the guide (by pressing on the bottle image, for example). Each label in the guide is accompanied by a textual explanation. The PRODUCERS section presents all the information on the producers included in the guide, along with the Vinum Index wines for each producer. 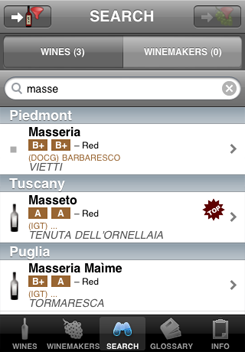 Use the SEARCH section to find the wines and producers by means of a search key. 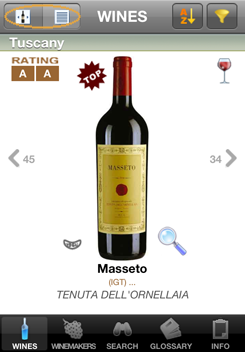 The top wines, as marked by the icon, , are the absolute benchmark products in international winemaking in historic and quality terms, irrespective of their price/quality ratio and availability. 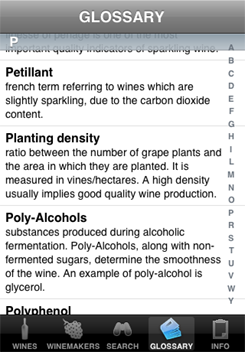 The glossary tab shows a very useful wine-wolrd dictionary, containing all the key words that are found in the guide. 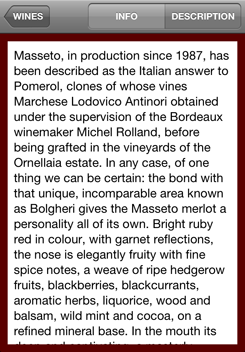 This section contains useful information on the production techniques used in Italy, the different types of wine and the tasting methods used by professionals. The INFO section contains a number of interesting documents (these can be expanded using the iPhone "pinch to zoom" method). 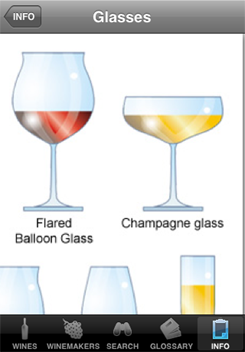 The first of these contains a brief description of the Vinum Index project, the second is the legend of symbols used in the guide, and the third is a poster showing the most suitable shapes of glass for the various types of wine.